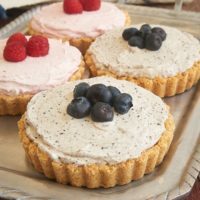 Berry Fool Tarts are such a fantastic way to celebrate your favorite berries in a super easy dessert! I’m so excited to share these super simple tarts with you, but I’m also excited about something else. My friend and fellow blogger Joanne is having a baby girl! I’ve known Joanne through her blog, Eats Well with Others, for a long time, but we met in person for the first time a few years ago. She somehow balances life, school, and blogging in an amazing way. And now she and her husband are awaiting their new addition! Some of Joanne’s blogging friends are throwing a surprise baby shower for her, and I’m absolutely thrilled to be able to help celebrate such an exciting time in my sweet friend’s life. Congratulations, Joanne! 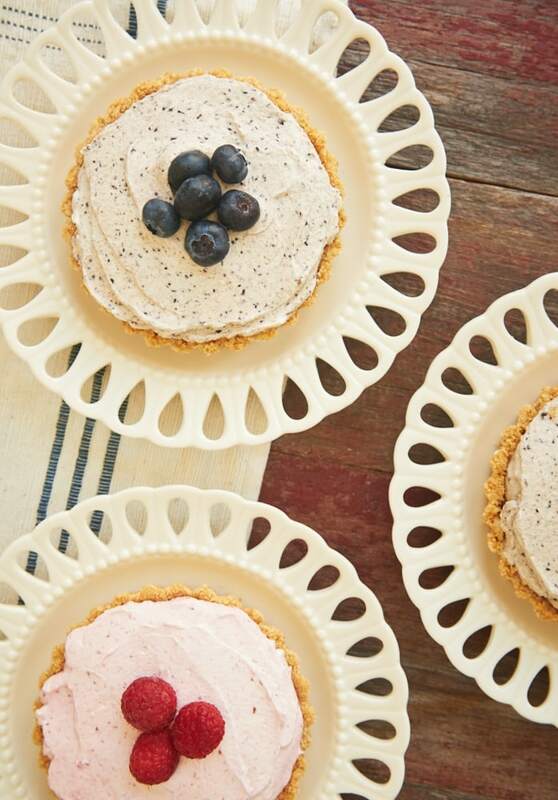 Okay, so let’s talk about these pretty little Berry Fool Tarts. They’re crazy easy and crazy good. If you can whip cream and operate a blender, you’ve got this. I made a simple cookie crust with vanilla wafers. You can easily change up the flavor a bit with different cookies for the crust. Graham crackers, pecan sandies, lemon cremes, and more would all be wonderful choices. I usually opt to bake cookie crusts briefly just to help them hold up a little better. If you prefer to skip the oven time, I recommend chilling them for about half an hour before filling them. Essentially, a fool is just a mixture of whipped cream and fruit. I find that berries work really well, but I just couldn’t decide which kind to use. In the end, I made two kinds – raspberry and blueberry. You can, of course, use whatever berry you like. Or use a variety if you prefer. From there, just combine the puréed berries with some sweetened whipped cream, and you’re set. Then all that’s left to do is spread it in the tarts and serve! How easy is that? Be sure to visit Joanne’s wonderful blog and also see what her other friends have made to help her celebrate! Homemade dessert doesn’t get much easier than these Berry Fool Tarts. A wonderful dessert for spring and summer! Combine cookie crumbs and butter until thoroughly combined. Press evenly into the bottoms and up the sides of 6 4.75-inch round tart pans with removable bottoms. Place the tart pans on a rimmed baking sheet. Bake for 10 minutes. Then, set aside to cool. 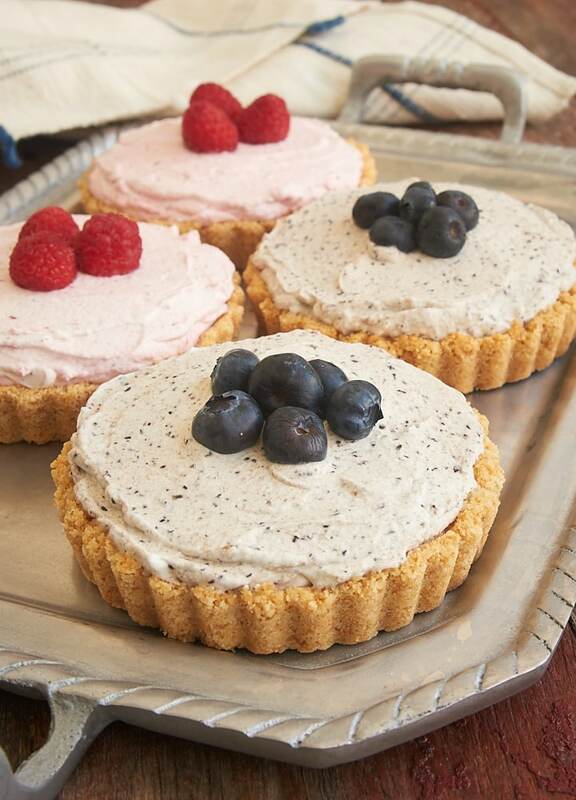 If you like, set aside some berries for garnishing the finished tarts. Place the remaining berries and the granulated sugar in the bowl of a food processor or in a blender. ** Mix until puréed. Refrigerate until ready to use. Using an electric mixer with a whisk attachment, whip the cream until it begins to thicken. Add the confectioners’ sugar and vanilla, and continue whipping until firm peaks form. Gently fold in the berries. Spread the filling in the cooled crusts. Garnish with berries. *You can opt to skip the baking if you prefer. After you press the crusts into the tart pans, chill them for about half an hour before filling them. **If you prefer to make more than one type of filling, be sure to divide the sugar when puréeing the berries.